If you love to style your hair, you know the number of products that you use to achieve a style can range. Depending on the product and style, your hair can start to lose its sense of moisture, which makes it easier to become dry and damaged. On top of that, sometimes shampoo and conditioner isn’t enough to help restore your hair back to its natural glory. However, more and more brands are coming out with detoxifying products to remove product buildup as well as giving your hair follicles nurture to help promote growth. In this guide, I’ll present to you some amazing hair products that does everything you need with little effort. 1. 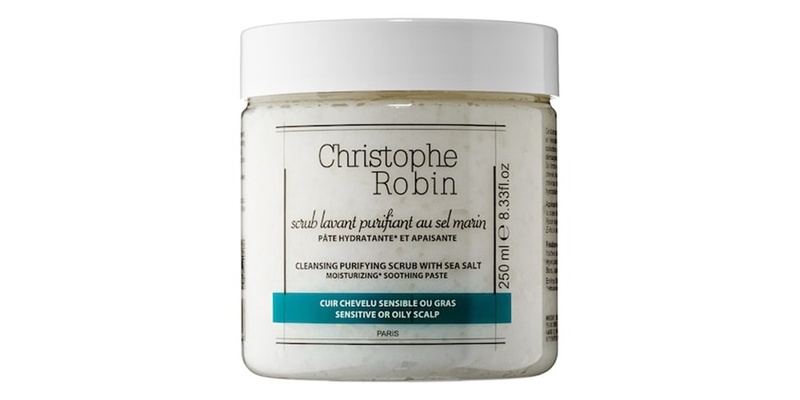 Christophe Robin: Cleansing Purifying Scrub with Sea Salt ($53): This product was created with the intentions of cleansing and soothing sensitives scalps as well as hydration. Although the product is a scrub, the grains are soft enough to where you the job getting done but not harming your follicles. When using the product, you apply a small amount to your hand and gently rub your roots with it. You’ll feel the difference after one rinse and realize that a little goes a long way. 2. Briogeo: Scalp Revival Charcoal + Coconut Oil Micro-Exfoliating Shampoo ($42): The charcoal and coconut oil combination is a win for any owner of this product. The charcoal helps remove the buildup in your hair while the coconut oil helps restore moisture, giving your hair a new life. Briogeo has a whole line dedicated to scalp revival so if the product works out for you, getting the whole line will help show results better and faster. This specific product in the line is a powder-exfoliant. 3. DPHUE: Apple Cider Vinegar Scalp Scrub and Hair Rinse Duo ($50): For a long time, apple cider vinegar has been talked about for contributing to so many health concerns, but it is also a key ingredient when it comes to nourishing the hair. DPHUE caught onto that and quickly made products, a scrub and a hair rinse. The scrub is used just like the Christophe Robin one: you use a little bit and it goes a long way. However, when you double to apple cider vinegar scrub and the rinse, you get the results that you’re looking for in just one use. As a bonus, DPHUE’s products come with color-locking technology so those with colored hair can use it without worrying about their hair color running out. 4. Bumble and Bumble. Scalp Detox ($34): Unlike the other products above, Bumble and Bumble. detoxifying product is a mousse that can be directly applied to the scalp. The product includes micellar water to help cleanse with salicylic acid to remove dead skin cells that can clog your hair follicles. The product is a win for those in-between days when you don’t have time to wash your hair thoroughly and need a quick fix to go. However, do not use the product back to back too often, as you can possibly stop the product from working as well as it can. 5. IGK: First Class Charcoal Detox Dry Shampoo ($27): Just like Bumble and Bumble, this is another product that can be used in case you’re running on little time. As for this detox, the product only removes the oils and odors that are coming from your hair. As it is good for a temporary use, it will not even the product buildup. It’ll simply open your hair follicles for it to breathe and last for a day or two. If you tend to have super oily hair, this will be the best dry shampoo for you. It soaks up oil better than most dry shampoo and doesn’t leave your hair dry to the done. All these products can be paired with your regular hair care routine. You don’t have to go out and buy the matching product to achieve optimal results. The products listed should not be used as an everyday product, as the products contain scrubs that can do more damage if used incorrectly. However, the products are well worth it once the results are felt and seen. You should style your hair whenever and however you want to, but you should also do some damage control after and it’ll be like nothing has changed.